Some people enjoy being able to communicate with others, and can have moments of being very talkative. While others can struggle to be all that verbal and enjoy being able to step back and listen for a bit. 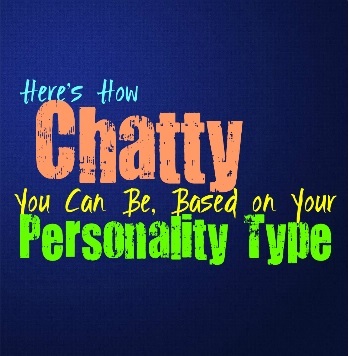 Here is how chatty you can be, based on your personality type. INFJs aren’t usually chatty people, especially in new social situations. They are excellent listeners, and enjoy being able to be quiet enough to really pay attention to the world around them. While they aren’t often chatty with strangers, they can be with their loved ones. INFJs can become talkative around someone they trust who makes them comfortable, but that doesn’t mean they are incapable of listening as well. They will enjoy the chance to express their thoughts and feelings, and will take time to sit back and let this person share their thoughts as well. ENFJs are often very chatty people who enjoy being able to express their thoughts and feelings. They are often very outgoing and have a great times being able to connect with others. ENFJs are often fairly talkative, even though they are also good at listening. They simply like being able to make a connection and can often be very verbal people. ENFJs can sometimes struggle to contain themselves when they are excited about something, and are usually chatty especially in the right environments. INFPs aren’t usually seen as chatty people, especially around new people. They can even appear quiet sometimes, since they don’t want to open up with people they don’t know just yet. When the INFP is around someone they love and trust, they can become rather talkative. While they might enjoy expressing their thoughts and feelings, and can appear more chatty than usual. INFPs do reach a point where they become drained though, and need to take a step back and possibly enjoy the silence. ENFPs can definitely be chatty people, especially when they are excited about something. When they are with someone they enjoy and feel at ease with, they can go from being chatty to being completely relaxed. ENFPs are often chattier around new people, since they feel their outgoing side come out stronger. They like expressing themselves and getting to know new people can be truly fun for them. ENFPs just don’t like sitting back and often feel like they need to participate in the conversation to really gain the most from it. INTJs aren’t usually seen as chatty people, and are more likely to keep things to themselves. They don’t become overly animated when conveying a point, and would rather process things themselves. INTJs are focused people who can certainly communicate comfortable with others, but they really aren’t considered chatty. While they will enjoy getting into an in depth conversation with someone who thinks on their level, it doesn’t mean they will be seen as overly chatty. For INTJs keeping to themselves most of the time is much more enjoyable than simply gabbing on about something. ENTJs can sometimes be chatty, especially around someone whose company they enjoy. ENTJs express themselves and their thoughts rather directly, and it does not make them uncomfortable to verbalize their thoughts. While ENTJs can sometimes be chatty in the right situations, most of the time their conversation style is more direct and precise. They are focused on getting things done and will do whatever it takes to get their point across in an efficient manner. INTPs really aren’t chatty people, instead they prefer to be on their own most of the time. Even when they are around someone they love, they often would rather spend quality time without constantly being chatty. INTPs can be quiet people, thinking through things internally and enjoying the time inside of their own minds. INTPs can certainly get into a good debate or in depth conversation with someone, but that doesn’t make them chatty people at all. ENTPs can sometimes be chatty people, especially when they are excited about something. They enjoy expressing themselves and often seek out people to get into heated debates with. ENTPs want to be able to connect with others and want to find ways to learn from their experiences. While they can be chatty when they want to be, they also enjoy having time to themselves. ENTPs like to switch things up, and will go from being more internalize to being very chatty depending on their mood. ISTJs really aren’t chatty people most of the time, and would often rather listen. They prefer to silence in most situations, since it gives them time and space to really think. They have a lot going on inside of their minds, and prefer being able to process information and spend time doing research. For ISTJs being overly chatty can be rather draining, which is why they sometimes feel the need to mentally disconnect when someone is too talkative. ESTJs can sometimes be chatty people, especially in the right circumstances. While they have times where they want to be on their own focusing on something specific, they also enjoy connecting with others. When the ESTJ is in a social situation they are usually very chatty, and like being able to express themselves and get to know some new people. ESTJs don’t mind being center of attention and often takes to this rather well. ISFJs aren’t often chatty people, and most of the time they enjoy the peace and quiet. There are times when they are excited about something or about being around someone they love, and during these instances the ISFJ can become much chattier. They want to be around people they care for, and do their best to make them happy. While they have chatty moments, most of the time ISFJs actually prefer to listen rather than speak. ESFJs can sometimes be chatty people, especially when they are excited about something. They often prefer to listen and enjoy letting their loves ones express their thoughts. ESFJs don’t feel the need to constantly fill the silence, and so there are times when they prefer not to be overly talkative. When they are chatty is when they are excited or passionate about something and want to share this with the people they care for most. ISTPs are definitely not seen as chatty people, and can even be a bit quiet around people they love. They have so much going on inside of their minds that it can be challenging to be outwardly expressive. ISTPs just don’t enjoy having to constantly talk about everything, but that doesn’t mean they are incapable of having long and in depth conversations with people. They know when to talk and when it is time to take a step back and listen. ESTPs can sometimes be chatty, especially around someone who inspires this side of them. They like being able to express their thoughts and sometimes their minds can be running rather quickly. ESTPs don’t become chatty around people they dislike, and can seem much more quiet and reserved. When they are with people who they have fun with and enjoy their presence then they often become rather chatty and expressive. ISFPs do have moments where they can be chatty, especially around the people they care for most. They enjoy connecting with these special people and sometimes their inner thoughts and feelings just come spilling out. Around new people the ISFP won’t appear that chatty, since they can sometimes be a bit shy and internalize with those they do not know. When they are with the people they trust, the ISFP becomes much chattier. ESFPs are definitely chatty people, mostly because they love connecting with others. They want to spend time talking with their favorite people, simply sharing their thoughts and feelings with them. Feeling connected is truly important for the ESFP, more than most people recognize. While they want to have fun and enjoy the present moment, being close to the ones they love is the most important thing for them. They are chatty people because they want to make connections and make new friends.